To see & use all of the features on our website please use the Google Chrome browser. We are an Approved Treatment Facility registered with the Environment Agency, we are also certified under the Control of Pollution Act and registered with East Hampshire DC as a Motor Salvage Operator. Plus we've been in business for over 20 years. Our yard is open: 8:30am - 5:30pm Monday - Friday, 8:30am - 5:00 pm on Saturday & closed Sunday. 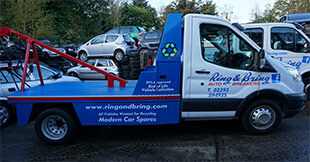 Scrap car collection in West Sussex	& Hampshire.